Metal detecting is one of the BEST ways to find gold nuggets! And there are still THOUSANDS of gold nuggets out there waiting to be unearthed. Our new 68-page eBook tells you how to do it! Metal Detecting for Gold – Expert tips for finding gold nuggets with your metal detector gives you a comprehensive look at what it takes to consistently find gold with a metal detector. Very few prospectors today can find gold on a consistent basis. They may get lucky and find a piece of gold once in a while, but becoming truly skilled at this type of prospecting takes research, skill, and perseverance! This eBook provides the foundation that every serious nugget hunter should have. Follow the advice and principles found in this report and you will be well on your way to joining an elite group of detectorists who are consistently exploring gold country and unearthing spectacular gold nuggets! We are confident that this eBook will help you in your search for gold. If for any reason you are not satisfied, we will gladly give you a full refund. No questions. We offer this 30-day guarantee because we know that the contents of this book will make you a better gold hunter! Finding gold nuggets with a metal detector is truly one of the last great adventures there is. And with the quality detectors on the market today, plus the high price of gold, there really is no better time to learn how to find gold with a metal detector! It is often said that 90% of the gold is found by 10% of prospectors. Do you want to be part of that group? 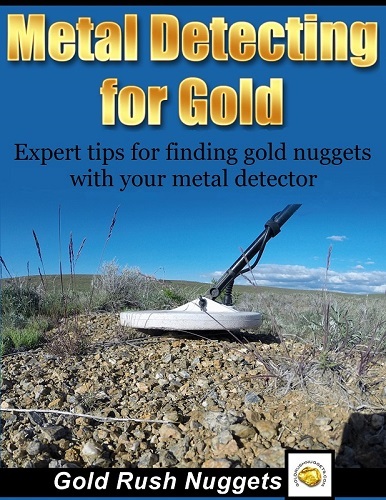 *The Metal Detecting for Gold eBook will automatically be emailed to you as a printable PDF after purchase. No waiting and no shipping charges. * This content of this eBook is for informational purposes only. It is each individual’s responsibility to ensure that they are in an area that is legally open to prospecting.